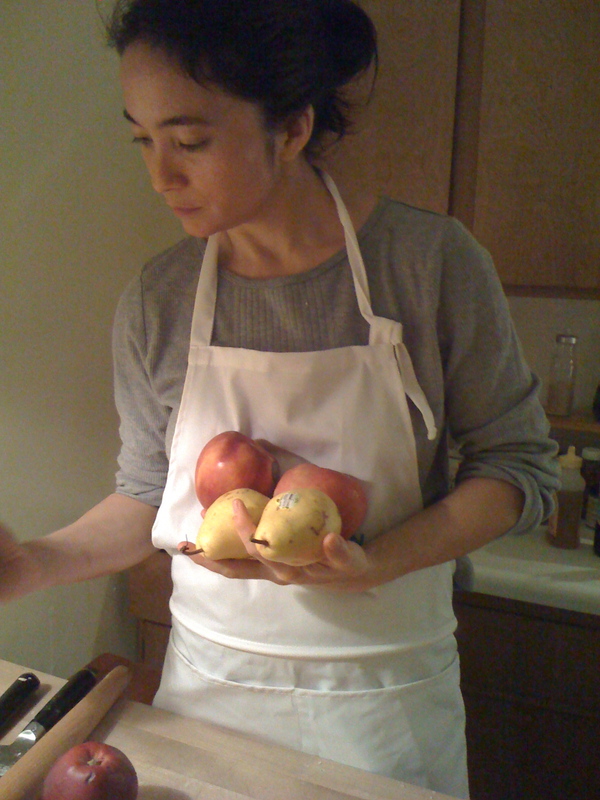 Because I am passionate about great food, was a professional pastry chef for 15 years, have been a vegetarian since I was 9, and am a total vegi-holic and burgeoning locavore living in the middle of New York City, people ask me about food all the time. And because my mom died of cancer in 2008, and I spent an amazing 6 months in the last part of her life trying to heal her with food, while at the same time trying to navigate the bizarre medical practices that are set up to “cure” cancer patients, I have developed a particular interest in exploring the nutritional and social aspects of all of those questions. For a long time I have been intrigued by the notion of food as a vehicle for higher consciousness, and more recently, the obvious and extreme need for higher consciousness around food. I am always looking for tricks to making really healthy food totally delicious, and proving that the experience of eating can be an adventure – 100% pure enjoyment, with the added surprise that it is good for you and makes you feel great! I want to give people that experience directly by listing recipes, notes, ramblings and also listing my favorite haunts and newest finds around NYC for great (mostly inexpensive) vegetarian food. Should I choose “Local” over “Organic” ? And if it says “Organic” is this a company that means it? What is “Cage Free”… “Humane Certified”… is it better than “Grass Fed”…? Not to mention the questions of “Vegan” vs “High Protein” or “Low Fat” vs “Low Carb”…! Some of these questions I have definite opinions about and others require a new choice on the fly each day. I hope you will join me in exploring these issues and others by posting your own questions, comments and suggestions. We have become a nation with a view of food based on fear, limitation, and media confusion rather than joy, exploration, and personal experience. And it’s killing us. The movement towards food consciousness that began in the 70’s finally seems to be gaining mainstream momentum, but now it is a race against an epidemic of obesity, diabetes, cancer and heart disease at untold levels. I personally believe that the key to turning all of this around is in understanding the value of food in every aspect of our lives, including physically, spiritually, and socially. I think it is really important to dispel some of the social myths and confusion we have around dietary fat, dairy, carbs, protein, “cheap” food, and lack of time to cook. And it’s equally important to understand that much of the “confusion” around real nutrition in this country is no accident – it is a very deliberate act by some of the most powerful lobbying forces in this country to keep the consumer misinformed. Its sounds like conspiracy theory, but the more I find out, the more I am horrified by how much worse this is than I even imagined. As a web marketer, I am a shameless promoter of things I believe in, so I want to use this blog as a platform to highlight and support the other people and organizations who are helping to clarify these issues and bring them to greater public awareness. For this, I have created a resource section listing of recommend books and websites. What do I mean about “Higher Consciousness”? Food and consciousness run hand in hand – the more conscious we individually become about what we put into our bodies: where it came from, what it took to get to us, as well as what it is actually doing to us, the better chance we have to pass this information on. This awareness needs to develop into mainstream thought so that our healthcare system will not collapse from simple ignorance, and our children and society as a whole will not either. Food is what we are made of, literally as an individual, and also as a society. What we choose to purchase, create, and put into our mouths directly is in no way separate from the entire social fabric we live in. We are what we eat. Who knew you could change the world by just eating better??? In the spirit of joy and adventure – thank you for joining me in making Conscious Food Choices! This blog is dedicated to my mother, Samm Hawley, who lived and died in the most wonderful, creative, positive way you could ever imagine. She loved food and art, and wove them all seamlessly into the tapestry of her life, mine and everyone she touched. I have had the distinct of pleasure of enjoying your food and I hope that more and more readers find you here! Thanks Jeff – me too! You’re welcome! Glad you enjoy it. Oh my God, I only just discovered this great site. and thank you Jorin for posting all those great recipes. Like you I love India and all the exotic spices, but also know that fresh food there is not the best choice. I love the picture of you cooking. You look like a healer, making potions. I guess you are, conscious vibration gets into the food and heals.